Sometimes you just need fruit. 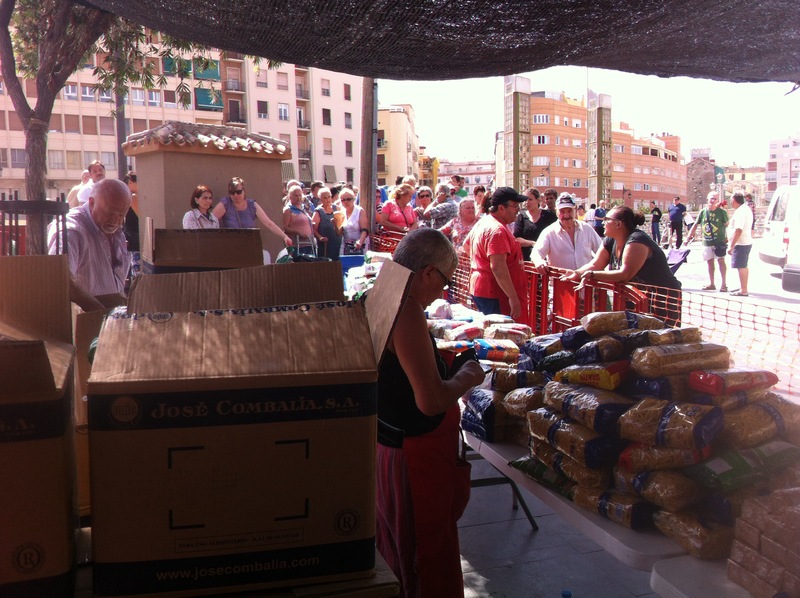 It was the big food distribution day at Los Ángeles Malagueños de la Noche, and the end of lunch service until September. The people in the queue had already queued for breakfast and queued to get a numbered ticket for the groceries, and it was way too hot to be standing in a queue. Even the volunteers were wilting in the heat, and we knew it was nothing like as bad for us as it was for the people in the queue. We had put up extra shades, extended the covered area, but it was never enough. Especially on groceries day, when the queue was longer than ever. 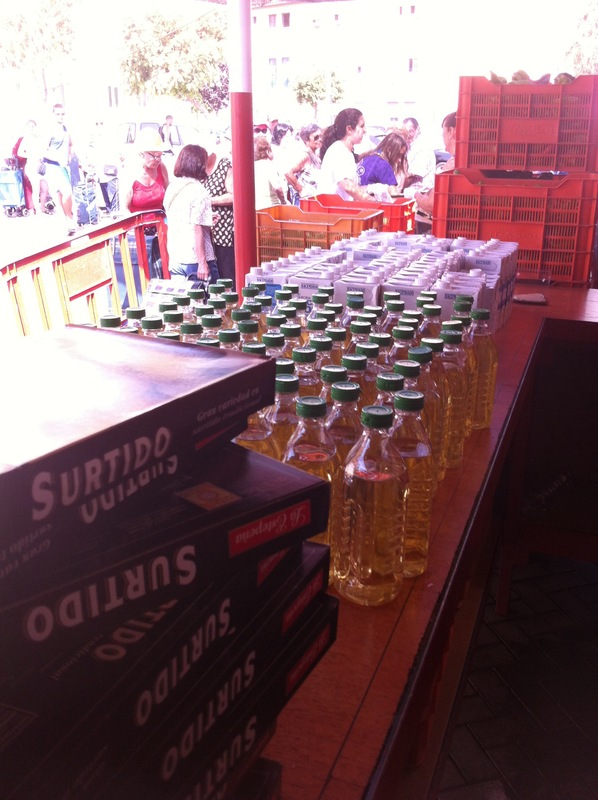 A line of volunteers inside the over-heated portakabin poured olive oil from big drums into half-litre bottles, banging the caps on, and stacking them in crates. Another production line scooped sugar from huge sacks into little bags, tying a tight knot, and tossing them into boxes. At the other end, three more volunteers did the same with powdered drinking chocolate. I started unboxing biscuits and stripping the outer plastic off the triple-packs, and stacking the single-packs in trays. Bags of rice and macaroni were left in the factory boxes, shouldered by the male volunteers and stacked under the tables outside. Milk, a thousand 1-litre cartons of milk, never enough, everyone always asks for more than we can give. The small van arrived and Cisse unloaded boxes of sweets, an added bonus, something to make the day’s distribution marginally less prosaic. The large van arrived from the storeroom, and Diego, Falli and Celestine unloaded big crates of green peppers, tomatoes, aubergines and watermelons. The 44th Al-Andaluz Boy Scouts arrived and began stacking the tables and sharing out tasks. La Jefa de la Caseta gave me my task – I was on milk. The queue began slowly so I was able to offer the choice of full-fat or semi-skimmed. Those with children could have the cartons with added calcium. But no second carton, not for anyone. Almost the first sentence I had learned at Los Ángeles had been “Lo siento, solo tenemos lo que tenemos” – sorry, we’ve only got what we’ve got. Our friendly Policía Local was scrutinising the queue, calming things down, avoiding pushing in. The number system worked well, but people with a long wait wouldn’t go far away, wouldn’t go round the corner into the shade. Too anxious. Too needy. Too hungry. The Boy Scouts accompanied the older or more frail people in the queue, carrying their bags as the heavy groceries became too much. On the last table, fruit and vegetables were collected, armfuls of green peppers tipped over the precious groceries, and a watermelon gently resting on top. The queue was endless. Maybe the knowledge that we weren’t going to be giving lunches for the hot summer months. It was blazing hot, 40°. A pregnant woman was taken out of the queue and brought to the front in the shade. The queue shuffled back a pace or two, uncomplaining. A Boy Scout stripped the plastic from the six-packs of milk to stack them beside me. They ran around, seeing what needed to be done, without being told. They brought jugs of water and plastic cups for the volunteers and for the hot, tired, thirsty people in the queue. Being prepared, putting others before themselves. Finally the last person filed past. Macaroni, rice, biscuits, sweets, chocolate powder, sugar, milk, oil, vegetables, and a watermelon. There was little left. 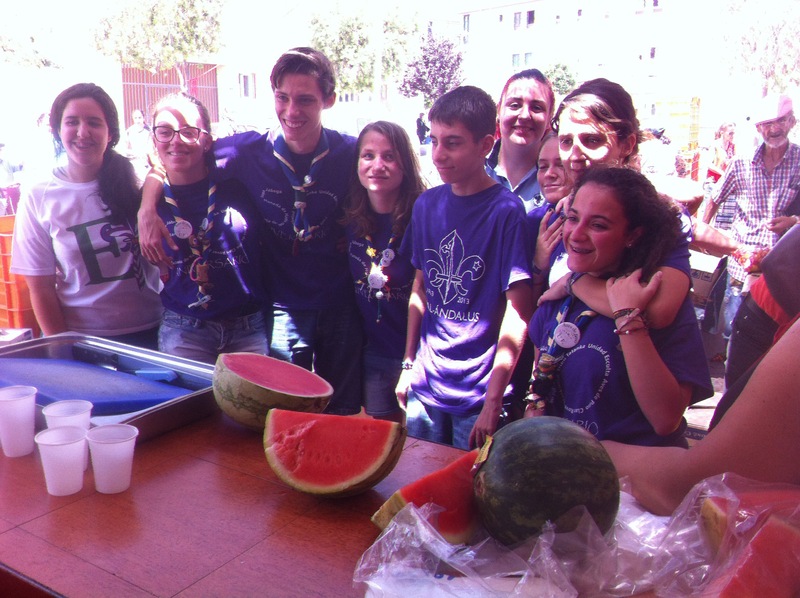 Four watermelons, so Antonio (our president) brought a big knife out of the caseta and carved slices for the volunteers and the scouts. Nothing had ever tasted nicer. Across the concrete plaza people from the queue were sharing watermelon too. We waved and raised a slice to each other and relished the cool melon. Thoughts of “them and us” or “givers and receivers” (had they ever been there) dissolved in the heat. We were all grateful recipients of nature’s bounty, of the generosity of the huge network of collaborators who donate to Los Ángeles, and of the fruits of our labours. A day later, in the dentist’s chair, Angel explained what he was going to do. Root canal treatment, never a favourite. For once I didn’t try listening to his conversations with the dental nurse. Sometimes, even this obsessive doesn’t want to practise! He gave me quadruple anaesthetic, but I still dug my fingernails into my palm to take my mind off what he was doing. But suddenly I tuned in. “Más fresas” said Angel. More strawberries? “Vale, ¿cuantas fresas?” asked the nurse. “Dame más fresas” repeated Angel. I concentrated. Was this the best time for him to take a fruit break? In the middle of my rather sensitive treatment? If he took a break, it was a short one. Another x-ray to check all was well, and we were done. As he detailed how long I should continue the antibiotics, I remembered the strawberries. “In the middle, why did you ask for strawberries?” I asked him. “Si, fresas” said Angel. Then he laughed and explained that the Spanish word “fresas” doesn’t only mean strawberries – it also means drill-heads! Probably just as well really …. 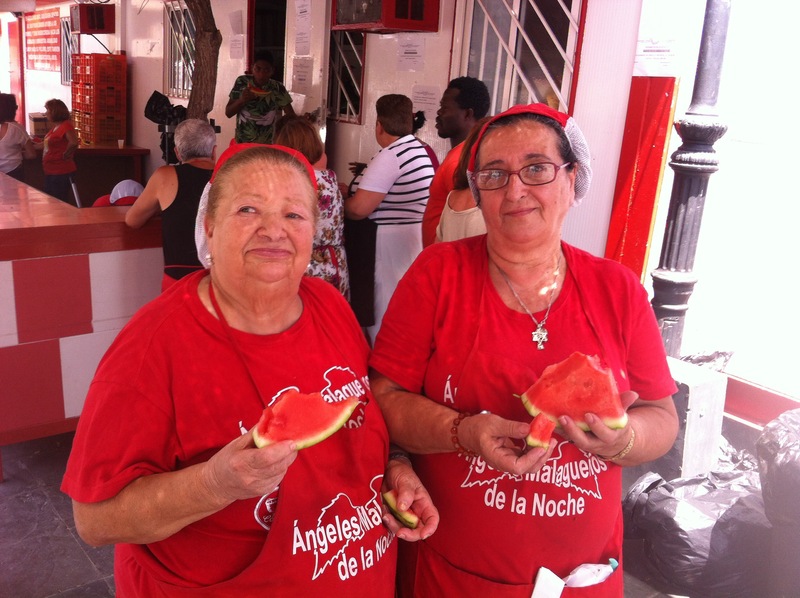 This entry was posted in Spain and tagged learning Spanish, Los Ángeles Málagueños de La Noche, Málaga, Spain, watermelon by tamaraessex. Bookmark the permalink. 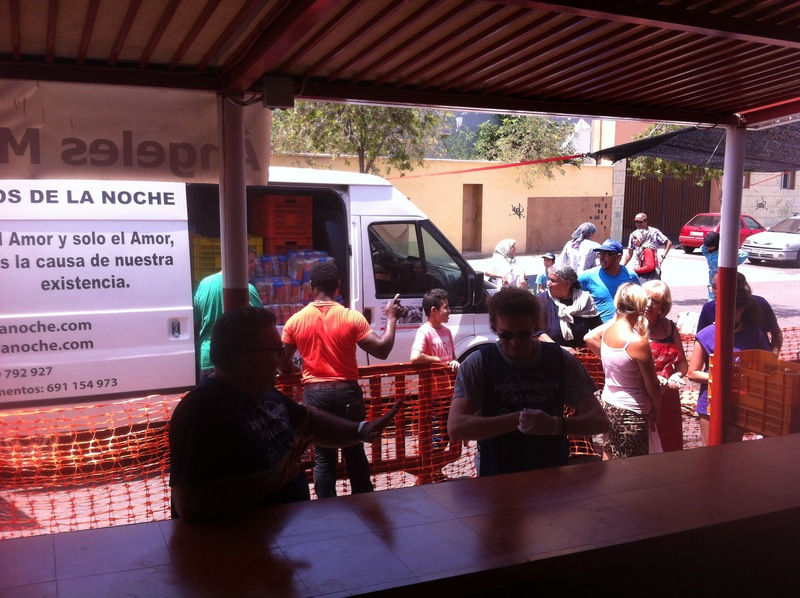 The Los Ángeles Malagueños de la Noche organisation does great work. I guess it’s just a pity that in this day and age, in a first world country, this is still necessary. Every shift I do, I feel the conflicting emotions – despair that the organisation is necessary, and pride that it exists.